First day here at LumberJocks… You guys seem to know your stuff! I work with hand tools. 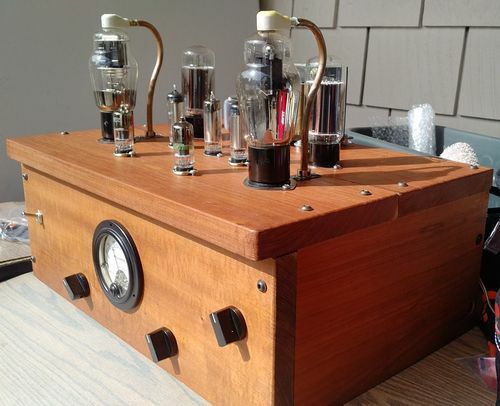 I’m making another stereo amp using Vacuum Tubes. This will be for my sister. I use wood for the chassis. It gets pretty hot under the chassis…0ver 110°F, which means the bottom of the board will become much warmer that the top every time it is used. This brings up the question of stability and the wood drying out. I have some Alder I can use along with Hemlock. I also found soft maple for a good price. I made a chassis with hickory…but data shows that it move a lot. The second challenge… My sister has a parrot…it likes to chew. I am told it won’t bother the amp. So I’m not sure if a softer wood would hold up at all…but one that doesn’t come apart in splinters would be better, I think. So is there a wood that would be better for heat? Am I worrying too much? Would soft maple, Alder or Hemlock do OK…not worrying too much about the parrot. All comments/ knowledge and opinions are greatly appreciated. Make sure you allow for a lot of ventilation so that air can flow through out the box so heat doesn’t build up. If you use quarter sawn wood it won’t move as much. The harder woods will be more chew resistant, of the choices you gave, soft maple is the hardest. I can’t really say I know much about heat resistance except to say that if you provide adequate ventilation you you should be okay with most any wood. I am looking for some clarification of your use of the word “chassis”. I share with you a second hobby in what could be loosely called “musical electronics”. Some Lumberjocks enjoy restoring a vintage machine, hand saw, or hand plane to near original condition for collection and/or daily use. I enjoy doing that with vintage music amplifiers and more obscure things such as tape echos from the 1960’s. I was a budding “rock star” in my teens way back then and owned some stuff and coveted a whole lot more. 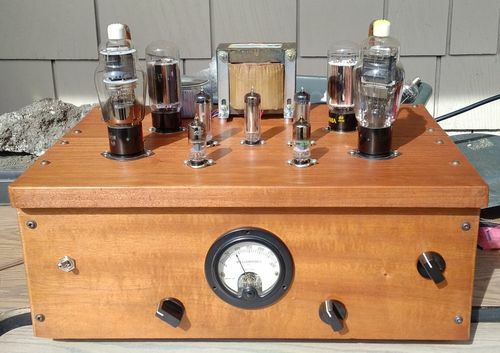 Years later I can now afford the time and money to pick up a 50+ year old tube amp or Echolette on Ebay and restore it. Like you, I also build gear from scratch both with point to point wiring and with printed circuit boards that I etch myself. By “chassis” are you referring to the actual box that holds the components or to the enclosure that surrounds it? 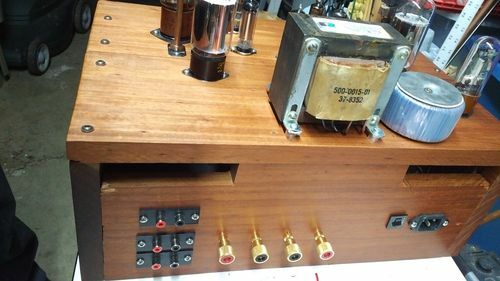 Most tube amps I am familiar with have a metal “chassis” for mounting the tubes, transformers, etc., with the actual circuitry connections being point to point, some sort of perfboard, or printed circuits. This is all mounted in a wooden (or some other material) enclosure. If by “chassis” you mean the enclosure, then Bondo has it nailed. Any wood should be just fine if you provide for adequate ventilation. I have a 1961 Fender Bandmaster amp that I bought used in 1965. The amp head and speaker enclosure are made from just about the cheapest pine boards they could find. The entire back of the amp head is basically open with just enough of a wooden face to protect the tubes. 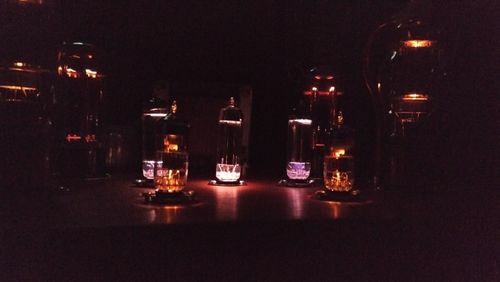 The airflow is adequate to keep the tubes happy. If your design allows you should try to build in a good path for airflow. Something like openings (slits, holes, a grille, etc.) low on the front or front edge of the bottom, and a good vent high on the back. If you really can’t design in some good airflow, then you might consider installing some cooling fans to help out. 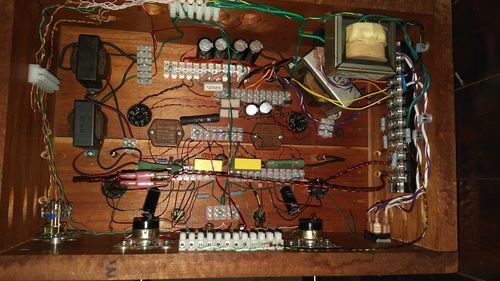 Got any pictures of your custom amps? By Chassis, I mean the structure that all the electrical components are mounted to. I know pine is a pretty stable wood. Hemlock may be the best as it does harden with time…and it has a low flame index spread…which I hope will never be found out. I use flame safe and oversized resistors to keep them cool. Below is the last stereo amp I made… It is out of Goncalo Alves and is left bare without any finish. Bare wood last 30yrs for a patio deck. It is a humble box in which I could have done the wood more justice. Hand tools other than a power drill. I hope to use some joinery this next chassis…possibly a mortise and tenon in the front. You can use thermally modified lumber. It is more dimensionally stable because it is less susceptible to cupping and warping. The wood has increased heat resistance and weather resistance as well. Ah, I get the picture now, That is a nice looking unit, even with very simple joinery. I think I see just a few ventilation holes in the gut shot picture. You can easily improve the ventilation by providing a flow pattern through the box. Several holes in the bottom along the front edge would not be visible. Combine that with some holes in the back along the top edge and you will be in business. You will want to make sure that you start with wood that is very dry to start with because the heat of the electronics is going to dry it further and possibly cause the wood to shrink a bit if it is not. Because your enclosures are relatively small, they probably won’t shrink all that much but with the heat, if your initial moisture content is too high, you could see small gaps in your joinery. You can buy a cheap moisture meter to check the moisture content before you begin. I would shoot for wood that has an initial moisture content of 10% or less if you can. If you can find it, quarter sawn wood will help reduce the effects of shrinkage. QS white oak will probably be the easiest to find. As for wood choice to deter the bird, you want a relatively high hardness (janka of 800+). You can look up the hardness and tangential shrinkage factors on the wood-database.com website. The best wood to withstand heat is a wood called Ipe, it is fire rated the same as masonry products, in addition, it is a very hard wood. As long as its ventilated and the wood is well dried, I can’t see an issue. How about a small fan like a computer case? But another consideration is plywood + veneer. It will open up use of all kinds of figured wood. I was looking at hardwoods I could use a brace drill to drill 1”+ holes in. I have so.e lyptus… 1500+ janka… but shrinks and moves a lot. This may not be an issue if I use joinery that allows the wood to move rather than just screws. Gonzalo Alves is around 2200+ janka… but stable. I tore ash up with the brace drill trying to drill large holes… I wonder if it’s not just the hardness of the wood, but the structural/ grain make up as well. I have read that softer woods were mainly used when using hand tools. From what I’ve worked with, cherry is considered soft…but soft pine seems like a relief after working with hickory. I think your most stable option would be good cabinet grade plywood. Or I suppose a good grade ply and you could apply your own veneer. custom veneer or even a contrasting wood. I just noted someone beat me to the plywood suggestion. Thank you. Plywood would be a great choice for an application like this. However. I really prefer to work with solid wood. Just my personal preference. How do softer hardwoods compare for joinery. Dovetail, tenon and mortise? Since the parrot likes to chew wood, don’t pick a wood that is toxic. That’s a pretty neat looking amp. I would install a small muffin fan in the rear with a small (1/4”) open gap at the front. just under the top. The overhang of the top, would conceal the opening.